Beyond Bernie Berkeley, CA meeting. Hundreds of people have already attended Beyond Bernie public meetings all over the nation. Hosted by Socialist Alternative and Movement4Bernie here are reports from the meetings from the weekend of July 9-10. More posted here! meeting room to watch an address from Jill Stein and Kshama Sawant, which was met with enthusiasm and cheers for a new party and a break from the Democratic establishment. A line formed when we opened up the discussion and dozens of people expressed their opinions about Bernie as a leader, local elections, “Brand New Congress”, the pros and cons of the Green party, and people also promoted their groups, including a movement to lower the voting age to 16. There was a general consensus that the Democratic Party is a dead end, and people were searching for an independent path forwards. At the end of the meeting, 45 people signed up to join Socialist Alternative because of our successful protests and marches locally and our national profile with an elected socialist, Kshama Sawant, in Seattle. Some of these potential members said they wanted a more focused discussion, sticking to politics and tangible next steps. That sort of process – of democratically debating the issues and then putting these collective ideas into action – is exactly what they will find in Socialist Alternative when they join. Today over 80 people gathered on the westside of Los Angeles to discuss how to continue the political revolution and build a party of the 99%. Organized by Movement4Bernie and Socialist Alternative activists, it was a crucial step towards breaking the two-party duopoly and providing a voice for working people. While watching video speeches from Jill Stein, Eljeer Hawkins, and Kshama Sawant, there were resounding cheers for the denouncement of our corrupt political system and the prospects of building an alternative. People were very excited for Jill Stein’s proposal of a green new deal and forgiving student debt. Many were inspired by the success story of Kshama Sawant’s election victory as a third party candidate on the Seattle city council. There was an emphatic cheer when all the speakers discussed Black Lives Matter. Socialist Alternative organizer Hanna Burge started the forum discussion part of the meeting by delivering an impassioned speech on the importance of building a party that gives a voice to working people: “The message needs to be emphasized that the Democratic Party cannot be reformed and is not an ally of the working class.” At the meeting, four people immediately expressed interest in joining Socialist Alternative. People lined up to contribute to the discussion. We heard from activists, delegates for Bernie Sanders, teachers, and students. There were disagreements of course, but the discussion as a whole was very positive and constructive. There were too many speakers lined up to fit into the time booked at the venue. Next time, we will book a bigger space with more time for people to speak! The excitement was palpable, everyone was hungry for change and looking forward to the next opportunity to continue building an alternative. 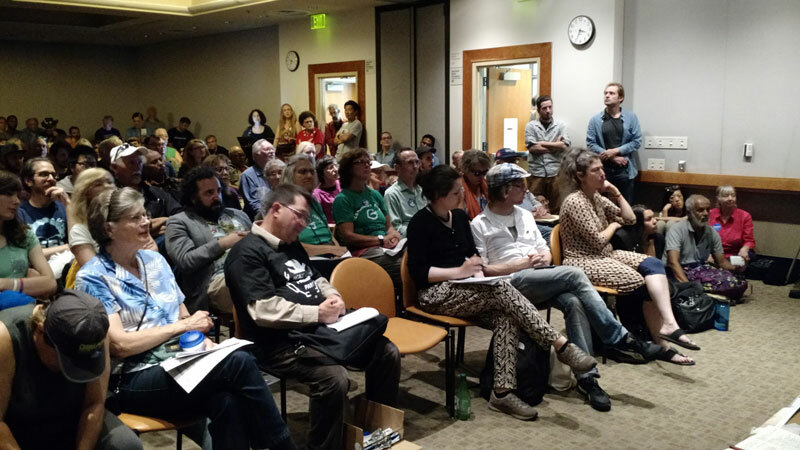 On July 9, the Houston branch of Socialist Alternative hosted around 40 enthusiastic community members, including Green Party members and numerous Bernie Sanders supporters, at the Beyond Bernie public event. 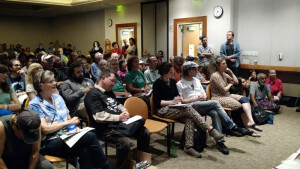 Following video addresses by Jill Stein, Eljeer Hawkins, and Kshama Sawant, attendees engaged in a spirited discussion. Hillary Clinton and her policies received nothing but criticism, and there was a lively exchange of ideas about how to maintain and channel the energy of the Sanders movement. The organization and activity of the new party of the 99% advocated for by Socialist Alternative was a topic of keen interest as well, and SA’s support for Jill Stein’s campaign was discussed. Thanks to everyone for coming out to raise their voice and show solidarity for a growing political alternative! Almost 100 people attended the Beyond Bernie meeting in Boston. Sanders – it was a tremendous success! With over 80 people in attendance and over $900 raised to help fund travel to the DNC protests, the broken Democratic Party will have no choice but to hear from angry and misrepresented workers from Boston during the convention in Philadelphia. After inspiring video addresses from Jill Stein, Eljeer Hawkins, and Kshama Sawant, Genevieve Morse lead-off a tremendous discussion about importance of breaking from the Democratic Party and building an independent third party by working people, for working people. The discussion was dominated by exciting contributions as people are beginning to sense the need for a party that is NOT invested in capitalism – which is responsible for savage exploitation of people in this country and globally. The door is open to build local grassroots campaigns and demand better living conditions for everyone who our capitalist system exploits and oppresses. As Joe from Veteran’s for Peace put it, “there’s this big wash of independent people looking for something!” And while we may just be at the beginning of building a challenge to the two parties of capitalism, meetings like the one Socialist Alternative called today could be an important stepping stone. A handful of folks were interested in becoming members of Socialist Alternative in Boston, and that is a terrific way to continue the fightback against the onslaught of austerity, neoliberalism, and budget cuts that seem to be perpetually threatened by the rich and powerful. Solidarity, and see you in Philly! Over 80 Chicagoans came out on a humid July 9 to discuss the way forward “beyond Bernie”. This was a few days before Bernie’s endorsement of corporate warmonger, Hillary Clinton and there was a strong, fighting mood to take things to the Democratic Convention in Philly. After watching the videos of Jill Stein and Kshama Sawant, still appealing to Bernie to break out of the Democratic Party prison, we heard Chicago SA member Darletta Scruggs’ message of solidarity with the resurging Black Lives Matter movement. An up to the minute analysis from new member Ryan Hartson, who first met us at our February Movement4Bernie rally, we went into a discussion with about 20 speakers coming in from the floor. First up was a chilling, in fact downright creepy account from a Bernie delegate about her experiences trying to work within the corrupt Democrat Party over the past several years: the takeaway quote being from an elected Democratic State Representative who took her by the arm at a meeting to discuss a bill to protect public employee pensions and told her: “Listen sweetie. It doesn’t matter what you want, or what you think. This is the way it’s going to go down and there’s nothing you can do about it”. This is the party that Bernie should never have entered. Representatives from the Illinois Green Party also came into the discussion, and the meeting ended with a financial appeal that raised over $1100 to take the Political Revolution all the way to Philly later this month. Another $250 plus was raised at the door and from literature sales, and plans were laid for a Chicago #March4Bernie during the Democratic National Convention. Following Emily’s lead-off, attendees spoke. Expressing oft-repeated disgust with the Democratic Party, some Bernie delegates described being “treated like trash” at having seen primaries stolen and the delegate process “railroaded” by the corporate Clintonite Democratic Party. One described the county platform “as the anti-thesis of everything Sanders stands for” in a county that went overwhelmingly for Sanders. One Green described this as an “amazing revolutionary moment” and warned of the “farce of a convention two weeks from now” in Philadelphia. She called for all left forces to “mobilize for Houston” and the Green Convention. A few expressed wariness over the use of the word “socialism,” as well as concern about whether a socialist economy could include small family businesses. These questions provided the opportunity to discuss the embracing of socialist ideas – complete with the bold use of the word itself – by growing numbers especially of young people, and the inability of capitalism, with its devastating social and environmental costs, to be reformed. NW Arkansas Beyond Bernie meeting. A huge thanks to everyone who came out Saturday night to learn more about how to continue supporting the causes dear to Bernie via Movement4Bernie, $15 Now, Socialist Alternative, and Dr Jill Stein’s campaign! Great to have 30 amazing individuals present (including a half-dozen who drove over an hour) to hear video talks by Jill Stein, L. Eljeer Hawkins, andCouncilmember Kshama Sawant. Thanks for your attendance and for all the discussion before, during, and after the meeting — let’s keep the momentum going! More photos to come. Photo courtesy of Layza Lopez-Love and Ryan Michael Lopez-Love. Madison, WI Beyond Bernie meeting. exposed for the first time to Jill Stein’s campaign and program, and Kshama Sawant’s democratic socialism. Members of the Progressive Dane coalition, the IWW, grassroots Bernie organizing groups, and the Green Party showed up. The mood was united against Hillary Clinton’s corporate politics – determined not to let a politician who was on the board of Walmart to be the standard-bearer for our movement. We had a lively discussion on the details of the Stein campaign and finding the correct balance of support between Bernie Sanders and Jill Stein before the DNC. The idea of a party of the 99% that is involved in direct actions as well as electoral politics was very well-received. After the public forum, there was a Black Lives Matter march on the state capitol and county jail. SA members and some attendees went along and added our numbers to the protest in defense of black lives. The Beyond Bernie meeting hosted by Olympia Socialist Alternative connected roughly 25 Green party members, socialists, and other community activists to discuss where to direct our energies now that Sanders’s campaign is effectively over. The vast majority of attendees were disappointed that he had endorsed Hillary Clinton, and were very receptive toward the idea of building a real workers’ party. Some still held illusions that progressive Democrats “Berniecrats” could reform the party from the inside but that was not the majority opinion. These issues and others were discussed at length until the meeting’s conclusion. Several activists were interested in joining Socialist Alternative and requested electronic copies of the New Member Reading Packet. Follow-up meetings with these individuals are being planned.